The Internet Business in a Box is a ready-to-go ecommerce solution. You simply step in and, with our 10 step consulting process, learn how to build, run, and grow your new online business. With over 20 popular niches to choose from, you're sure to find the perfect fit for you. Each site will be loaded with 800 drop ship products, meaning you hold no inventory. The Custom Built Business allows us to build your site with your input along the way. You'll be able to decide on your design, the products you offer, and much more. If you like the idea of being mentored through the process but want control over the look and feel of your new site, this option is for you! The Build-Your-Own Business Package is perfect for those who already have a product line, an ecommerce site, or know what they can and can't handle for their project. Just complete our 5-minute questionnaire, selecting exactly the services you need, and get your quote in minutes! Pure-Ecommerce would love to partner with you on the aspects of your business that you just don't have time for. Blogging, SEO, product descriptions, social media...the list is endless. If you just need a little boost, we're here to help. Upgrade To Platinum - What's Included? Concept: It's time for play! Welcome to PlayHouseEssentials.com where children of all ages can shop for a variety of toys for hours of enjoyment. Here people can shop for an array of educational and quality toys for all their "playhouse essentials". 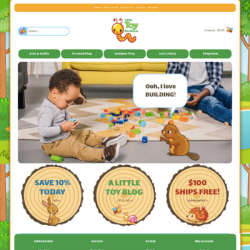 Online shoppers will enjoy the easy to navigate categories including toys for imaginative play with dolls & houses, creative play with educational games & puzzles, pretend play, outdoor play, as well as, clothes & accessories for babies too! 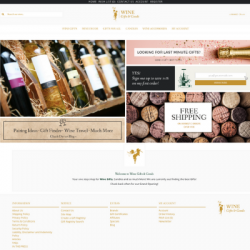 This is a 100% responsive design website with lots of outstanding features and shoppers will love the look of the site no matter if shoppers are using their PC, smartphone or tablet! This website offers an array of essential marketing applications including scrolling images on the home page, product showcase, banners promoting the newsletter, blog and sales, plus you can connect with your customers with the connected Facebook, Twitter and Pinterest pages! 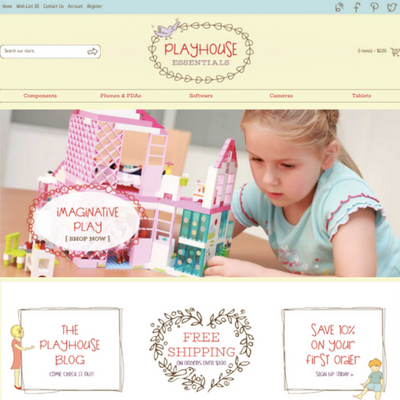 You can share tips for creating the perfect playhouse, playful ideas & inspiration, new products, sales announcements and much more! When you choose to work with Pure-Ecommerce you will receive outstanding consulting from our talented and helpful team. You will receive 40 hours of step-by-step ecommerce consulting and access to our exclusive 10-step instructional program in our eLearning Library. We will teach you the steps you need to take to set up, run and market your new online business. Looking for even more assistance? Then you should consider our Platinum Package Upgrade to give you a jump start with SEO, Social Media, Consulting and much more! Dreaming of starting your own business? Then dream no more of owning your own online business - make it a reality with this fun to run toy internet business. All you need to do is take the first step today to get started on your path to ecommerce entrepreneurship and we are here to help you! Contact us now to request our complete information package including our price list. We look forward to working with you! The toy industry’s annual total economic impact in the U.S. is calculated at $77.35 billion as reported by the Toy Industry Association. The global Toys and Games market is projected to exceed US$135 billion by 2020, driven by innovation, technology development and the launch of smart toys and educative games. What's Included with this Business-in-a-Box? 100% Responsive Design for Optimal Shopping Experience - Make a great first impression with a beautiful responsive design that works well on PCs, tablets and smart phones - Built for optimal search results! Access to the Pure-Ecommerce ELearning Library - FREE UPDATES! Our Platinum Package Offers You Additional Services to Help Jump Start Your Ecommerce Business! *Optional: Product Description Rewrites - 300 product website will include rewrite 300 product description rewrites and an 800 product website will include 800 product description rewrites. For detailed information about this upgraded package, visit our Upgrade to Platinum page. Kickstart your new internet business with our Platinum Package. Scroll down for details. We offer 3-month payment plans on all of our Internet Businesses for Sale. Choose this option at checkout! LittleToyBoutique.com designed by Pure-Ecommerce Responsive Design Website Part of Our Premiu..
LightAndLoveBoutique.com designed by Pure-Ecommerce Responsive Design Website ..
VictorianChicBoutique.com designed by Pure-Ecommerce Responsive Design Website Part of Our Pr..
SkipAndHopToyShop.com designed by Pure-Ecommerce Responsive Design Website Part of Our..
SweetJavaDreams.com designed by Pure-EcommerceResponsive Design Website Part of Our Premium Site C..
BedBathFloorAndMore.com designed by Pure-Ecommerce Responsive Design Website Part o..
SeaStarBoutique.com designed by Pure-Ecommerce Responsive Design Website Part ..
​ SassyUnderthings.com designed by Pure-Ecommerce Responsive Design Website Part of Our P..
SmallAndStylishHome.com designed by Pure-Ecommerce Responsive Design Website P..
MeowtimeMarket.com designed by Pure-Ecommerce Responsive Design Website Part of Our Prem..
OnMyTimeTravel.com designed by Pure-Ecommerce Responsive Design Website Part of O..
WineGiftsAndGoods.com designed by Pure-Ecommerce Responsive Design Website Part o..
What is a Business in a Box? What is a Merchant Account?